Looking for unique bird houses out there? Stop and look no more, take a look at this reviews of the most interesting designs on the market! The birds will use the houses for nest in summer, or to roost over winter. These hand felted natural wool painted birdhouses are made of water repellent wool, that will naturally dry itself out if it does get wet. If the birdhouse is kept outdoors and get rain, the water repellent color will protect it, and the rain will slide down the sides. It is made of all natural material, like hemp hanging cord, and a two side bamboo perch above the entrance. The entrance to the house is a 1/4.inch diameter hole that is suitable for small birds like wrens, chickadees, titmice, finches and nuthatches. If you desire to extend the opening for larger birds you can do it yourself. Recycled paper is stuffed inside for transport to maintain shape. 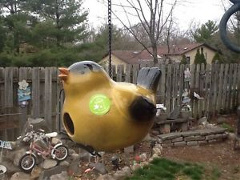 Manufacturer claims that if exposed to harsh weather like rain, snow and sun, the birdhouse will last for one year minimum. If kept under sheltered protected place for a lifetime. The material is 100% natural wool and made of non-toxic dyes, assembled by skilled workers from Nepal. That makes it biodegradable and can safely be placed in nature. It is made to maintain structure for one year minimum if exposed to snow and rain. If kept in protected place like under roof will last for many years. Color will fade in the direct sun, you can prevent this by placing it in shaded area. These painted birdhouses are waterproof. 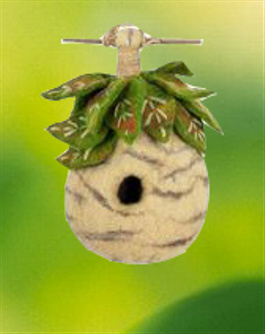 If the birdhouse is kept outdoors and gets soaked by heavy rain, the felted wool serves as natural water repellant. It will not allow rain to seep inside. The nesting bird will be protected from moisture. Keep it away from squirrels, don’t put seed inside as squirrels can damage the birdhouse. If the birdhouse is kept away from feeders squirrels will stay away from it to. These painted colorful birdhouses are easily cleaned by opening the bottom, only clean when birds are not using it. If it gets dirt use a soft brush to clean it. You can use cool water with soap to wash it lightly, make sure birds are not using it at the moment. If the house changes shape, soak in water, then re-shape as desired, and let it dry natural. Don’t wash mechanically as it may get damaged. 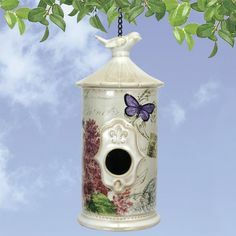 This are cute little bird house , that can be used as decoration also, but will attract small birds if placed in the right place. It comes in lots of different adorable designs. This strawberry shaped colorful bird houses are made of ceramic materials. Painted strawberry red, with a little bee designer touch. It is handcrafted and painted with good quality. The size is big and spacious , this birdhouse will attract birds like bluebirds, it is not for smaller bird types. Under the entrance hole is a little perch, but it is not so big, somehow it looks like it is to small for the bird to normally perch on it. 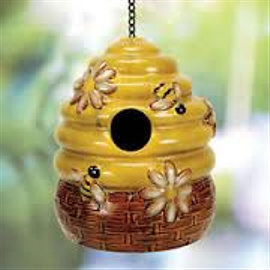 This birdhouse is good for a garden, backyard or a porch, it will give a decorative touch where ever it is placed. The colors are earthly tone, and will fit easily next to a fence. There is a hole in the bottom for easy access and cleaning, you can use soap and warm water, brush can be used to clean the inside. There is no worry that color will fade, as it is quality design. Hand wash only not to damage it. 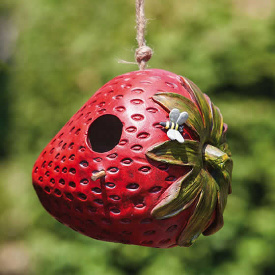 The Strawberry Unique Bird House comes with a rope connected to the top. The rope feels sturdy and looks like it will hang with no problem. 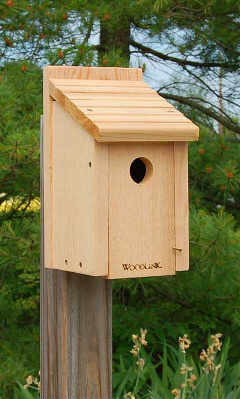 The birdhouse is equipped with a hole at the bottom for cleaning, but it lacks drainage. So place it in the spot where it is not exposed to direct rain. It will attract larger birds like bluebirds. Packed in solid cardboard box. It’s a unique birdhouse, for people that look for beauty and design. Bluebirds start to nest around February or April, they will do more than one nesting in season. They usually use woven grass and straw to make the nest, and like to nest in cavities of some that is available. You will find from 4-6 eggs in the nest, of powder blue color. The bluebirds are quite tolerant of humans watching the nest, and will not abandon the nest even if we touch the eggs or the babies. So if you want to check the nest from time to time there is no fear, but it is recommended not to do it if not required. This birdhouse is designed to attract bluebirds, constructed of durable reed cedar, that is weather resistant and insect repelling. Ideal for the Eastern, Western, and Mountain Bluebird. It comes with a 1 1/2” entrance hole that is just the right size to attract eastern bluebird, but will attract all of them. The front is equipped with an easy open panel, so you can check the birds from time to time, and monitor the babies without disturbing them. The birdhouse comes with a ventilation hole at the top, and a drain hole at the bottom to provide water to escape. This bluebird house is easy to clean, just open the front panel and clean after the end of season. The bluebirds are not dirty, so they will keep the birdhouse clean. This art design bird house is made of quality heavy duty porcelain. It comes in red and blue color. There is a forged steel hook that goes on top for easy hanging. Design is made of deep egg shape, and will attract birds like woodpeckers and house wrens. This special design will give protection from predators. These painted birdhouses features one 1/8-inch opening and cavity nesters will find a home in it if placed in the right spot. It will attract woodpeckers if placed on a tree. This is one of the most unique bird houses for sale, and is equipped with easy removable bottom screw off cap. This gives easy access for cleaning and washing. Color will not fade from cleaning, and detergent can be use. Clean at the end of the season when the birds finish nesting. 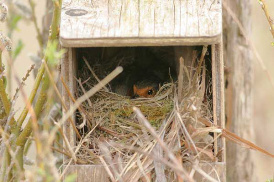 Put the house back as birds can use it for roosting. The birdhouse is equipped with a steel hook, that goes on top. It is easy to hang design. You can place it on trees to attract woodpeckers. Place the house between 1.5 and 7 m high in semi open area to attract house wrens and chickadees. All in all it’s a nice unique birdhouse, its design will complement any backyard. This house will last in harsh weather. Check Byer of Maine Alcyon Bird Home here. This cowboy boot colorful bird houses are made of sturdy material. This nice bird house is hand painted with lots of authentic details. Cowboy boot is made with lasting color, it is waterproof and can be hanged outside. The hat serves as a roof, but the protection is not sufficient. You must place the birdhouse in a sheltered area under some protection from rain. Water can enter the entrance hole in heavy rain. This is a true unique bird houses for sale design. The birdhouse has 1/2" Dia. Opening with a perch underneath for the birds. Opening is suitable for small birds like sparrows and house wrens. Larger species will be deterred from nesting inside. This bird house design comes with an opening at the bottom for easy access and cleaning. You can hand wash with warm water and soap, don’t use washing machines. It is recommended to clean the birdhouse every year after nesting season. These painted birdhouses are water proof. Cowboy boot birdhouse comes with a 6 inch metal hanger. It looks sturdy and easy to hang at the desired place. Place the birdhouse in a protected area from direct rain. Material is waterproof, but there is lack of protection above the entrance hole from water. Additional protection is recommended. This western design unique bird house is fully functional and will complement lots of backyards, and can be used as décor indoor. 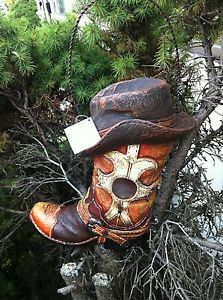 check Cowboy Boot And Hat Hanging Garden Birdhouse here. This birdhouse is made of hand glazed porcelain, and hand painted. Vintage design with flowers, letters and ornaments give this house old-world charm. Its classic style will add to your backyard or patio, The birdhouse looks sturdy and looks like it can stand in harsh weather, and will last for years. There is one opening hole 1.25" in diameter for the birds to enter. And is equipped with a cleaning hole at the bottom. It will attract small birds like chickadees, sparrows and house wrens. 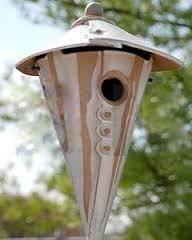 This kind of bird houses design is equipped with a cleaning hole in the bottom. This gives easy access to your annual cleaning. It can be washed with warm water and soap, this house is easy to clean as porcelain will not get damaged by brush. You can submerge it in water or clean it in dishwashing machine. This birdhouse is no brainer for cleaning. This nice looking vintage birdhouse is equipped with a chain that is connected to a hook. Hanging is easy, and will not fall if properly placed. The entrance hole lacks protection from rain, there is no roof. In heavy rain water might get inside. Place it in a more protected area under some tree or man made cover. It is best to hang this unique birdhouse in a quiet place where you can watch the birds nest in it. It is also a good roosting place. The design and hand painted ornaments give this house a classic style must for any backyard or porch. The entrance hole lacks protection from rain. But if placed in a secure spot, will have tenants soon and will give you lots of bird watching. Check Modern Vintage Bird House, Rose here. This blue birdhouses series are inspired by an enchanted and magical woodland forest. 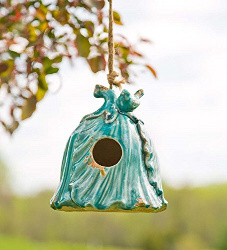 This Blue Flower Ceramic Birdhouse is made of ceramic material, and hand painted blue. The bird house looks sturdy and well made, the design looks artistic and will complement any back yard. It will become your feathered bird friends and garden fairies favorite accent. 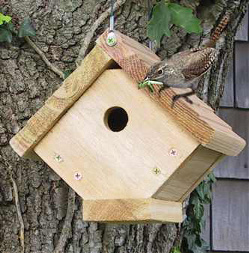 The design is featuring a wooden perch below the entry hole that is made for small birds like sparrows and chickadees. It will attract smaller birds, big birds will not enter. This blue ceramic unique bird house resembles an upside down flower bloom with a small songbird perched on top. This bird house will last in harsh weather, it is water resistant, but lacks the roof. It is recommended that you place it under a tree or some added cover. If the wind is strong the rain can enter the hole if hanged in open. Finished with a weather-durable, crackled glaze, this elegant flower birdhouse will add a rustic, shabby chic look to any home's exterior. It's a lovely way to keep your backyard birds safe and dry if placed right. Jute rope hangs easily from any porch, deck, tree limb or shepherd's hook. You can use it as a décor if you don’t want to attract birds. Check the Blue Flower Ceramic Birdhouse here. Are a delightful way to have birds visiting your gardens in the spring and summer. The bird house is made o porcelain and hand painted to look like a yellow finch bird. It looks sturdy and I water resistant, it can be hanged out on the open, and in rain. Bring home the joy and vitality of these feathered friends year-round with the Yellow Finch Birdhouse. The vibrant yellow adds a dash of summer splendor to your outdoor gardening area, backyard, or patio, lightening the mood during even the harshest elements. This unique bird house are water proof, but lack roof kind of protection. It is best to hang it under some cover, or under a tree so rain cannot enter in the entrance hole. Hang in a nice quiet place away from noise. The hanger chain is sturdy and easy to hang, there is a drain hole for water at the bottom. The Yellow Finch Birdhouse measures 5 1/2" x 7 3/4" x 6" high and comes with a cleaning hole so that it's always ready for a new bird family when the last ones are finished. Cleaning is easy, you can wash it in water and soap, clean after the birds finish using it for nesting. Once a year is fine. Check the Nature's Garden Bird House, Yellow Finch here. This Unique bird house is constructed by hand, and made of clay slabs. Splendid stoneware birdhouse features a tapered/conical shape that provides an enticing enhancement to the garden and the backyard. 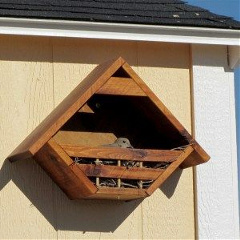 The 1.25" opening on the house is ideal for a variety of small songbirds and will attract chickadee, wren, warbler, nuthatch, titmouse, or similar nesting birds. Big Birds will not nest as the hole it to small. An interior platform provides a flat surface for nesting and dry place for birds while a removable top allows adequate ventillation and easy seasonal cleaning. You can clean the house one a year off season. Use water and soap, then left to dry, the color will not fade and the house is durable. It will stand in harsh weather like rain and snow. This painted birdhouses are made to last. Each of these unique bird houses are individually constructed by hand from clay slabs and fired to 2400-degrees in the mountains of North Carolina. Every bird house is equipped with a braided steel cable hanger that look strong and easy to hang. Stoneware pottery will not fade and is unaffected by harsh weather. Place the house away from wind as it can swing and disturb the birds. It is good to place it under some cover like a tree to protect it more from the element and provide peace to the birds. It’s your looking for a unique bird houses for sale, this is a must, and will look stylish, don’t forget to place it in a quiet place. It comes in royal blue, butternut gray, and teal green color. These painted birdhouses are for the style affectionate. Check Hanging Stoneware Cone Birdhouse - Handthrown Pottery here. Perfect dove bird house, easy to hang, and will attract doves to your home. Click on the link for a more detail review. Read more about these great wren and chickadee bird houses! Made of sturdy cedar wood and will last for years. Wren & chickadee bird houses reviews. 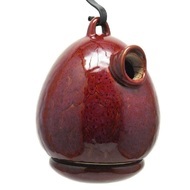 These great ceramic bird houses are perfect for decoration or as functional bird houses. To sttract swallows you must folow some basic steps, and your bird house must be placed well. Read more about this swallow bird house here. Nice and simple robin bird house, that is designed to attract robins to nest in your backyard. Fashionable and welcoming nest house for pigeons and doves, surely your lovely bird friends will be thankful. Check the pigeon bird house here. Hope you liked this unique bird houses for sale online reviews and come back to see new birdhouses every month , and keep attracting those birds!